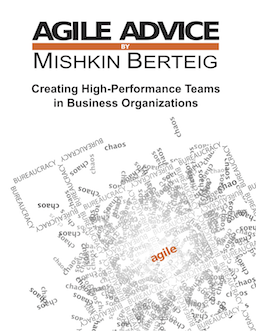 Queues of work form at three types of levels in an agile organization. At the largest level is the project portfolio. The queue for this level contains all the projects that are not yet being actively worked upon by project teams. At the intermediate level is the backlog of project functionality. The queue for this level contains packages of business function or infrastructure components necessary to implement business function. These packages are selected by a project team to fit into a single iteration. The packages in turn are also elements in a queue. This smallest level of queue contains individual tasks required to implement all the business function and infrastructure that make up a selected package of work. The team members select tasks off this queue based on priority and dependencies.